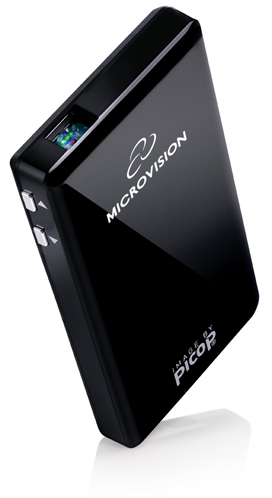 Microvision Inc has just announced the second generation of its SHOWWX laser pico projector which was released in November 2010. The new SHOWWX++ is very compact and fits in your back pocket.SHOWWX++ uses laser scanning technology to display images. This product is specially made for iPod,iPhone and iPad. This is also compatible with other devices like smart phone,TV/Video-Output adapter, camcoders and cameras. Various accessories are available for this device from Microvision . Know about them here. New SHOWWX++ now supports HDMI out. Watch this video to know how it works.